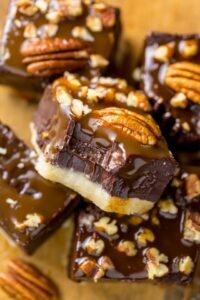 Salted Caramel Turtle Fudge Bars are so easy to make! 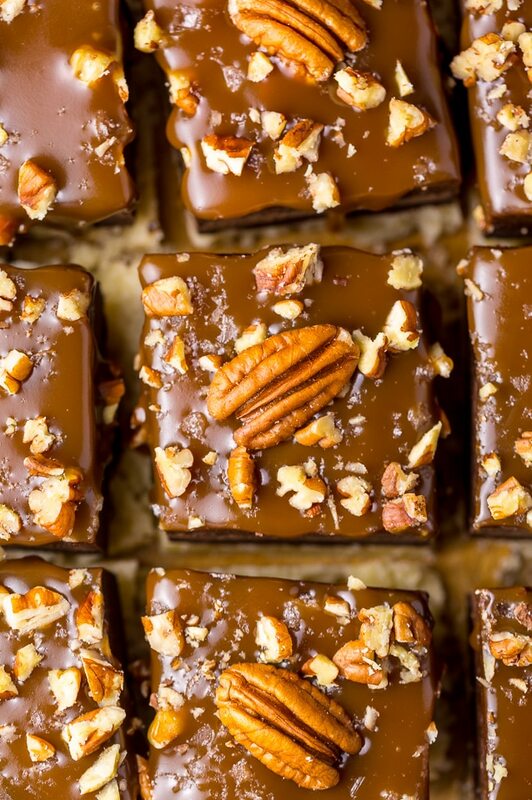 These Salted Caramel Turtle Fudge Bars are crunchy, creamy, and chewy! And the best part is they’re so easy to make. 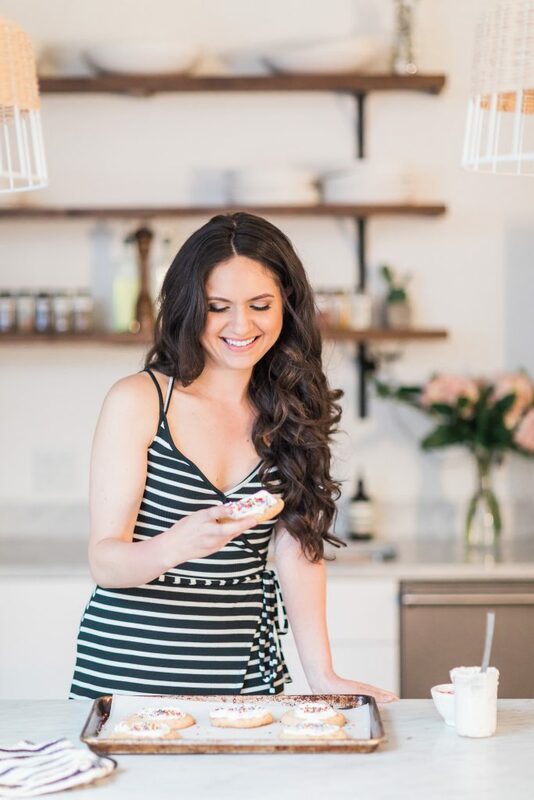 Remember when I showed you how to make easy salted caramel sauce? Well, today we’re going to put that sauce to use! Because we’re making Salted Caramel Turtle FUDGE Bars!!! This recipe calls for 3/4 cup of salted caramel sauce, and while you probably could use a store bought variety, I really hope you’ll try making my homemade version. You only need a few ingredients to make homemade caramel sauce and it’s a million times tastier than the store bought varieties. Plus, it’s super fun to make. Win, win, and win! But let’s move on from the caramel, because these salted caramel turtle fudge bars have so much more going on. Let’s start with the base of these bars, which is a super simple shortbread crust. I love this crust because it’s perfectly buttery, just a little crumbly, and not too sweet. On top of the crust is a decadent layer of chocolate fudge!!! And then, to top it all off, these bars are covered in gooey caramel sauce and a hearty sprinkle of crunchy pecans. The shortbread dough will be a little crumbly, but don’t fret – this is totally normal. Here’s what you want to do: dump it into the prepared pan and press it into an even layer. I like to wrap my hand in a piece of saran wrap to make this step really easy, but this is totally optional. You can press it down with the bottom of a measuring cup or just use your bare hands. Be sure not to over bake the shortbread layer. I recommend starting to check it around 13 minutes, since all ovens run a little differently. If you don’t own a microwave, or prefer not to use one, the fudge layer can be made in a double broiler. Be patient while melting the chocolate. Doing this step slowly, and on low heat, ensures your chocolate won’t burn or become gritty from overcooking. I recommend using high-quality chocolate for this recipe. I used Lindt 70% chocolate, but use any brand you know and trust. Just be sure not to use chocolate chips, which have inferior flavor and texture for a recipe like this. Once you cut the bars, the caramel will run a little bit, but not a lot. It actually makes each individual bar look super pretty! I recommend cutting the bars very small and serving them with plenty of napkins. For decoration, press a whole pecan onto each cut bar. This is totally optional! 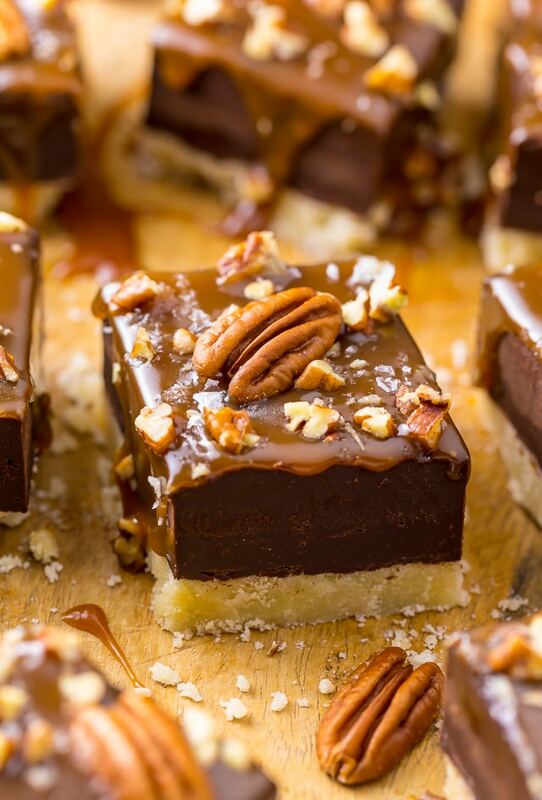 You could also dip half of each pecan into a little chocolate before topping the bars, for an extra dramatic look. 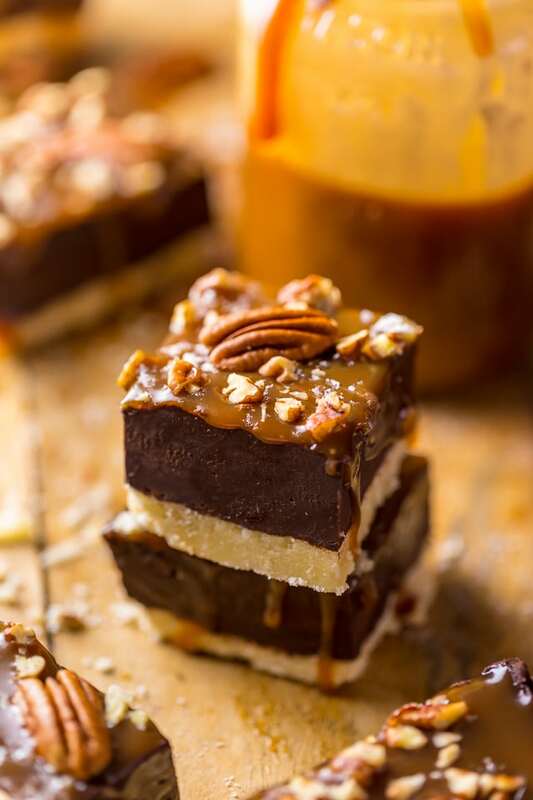 These Salted Caramel Turtle Fudge Bars will need to set for about 2 hours in the fridge, so be sure to plan ahead time wise  Also, if you keep them in the fridge for longer, you may want to let them rest at room temperature for about 20 minutes before cutting them. 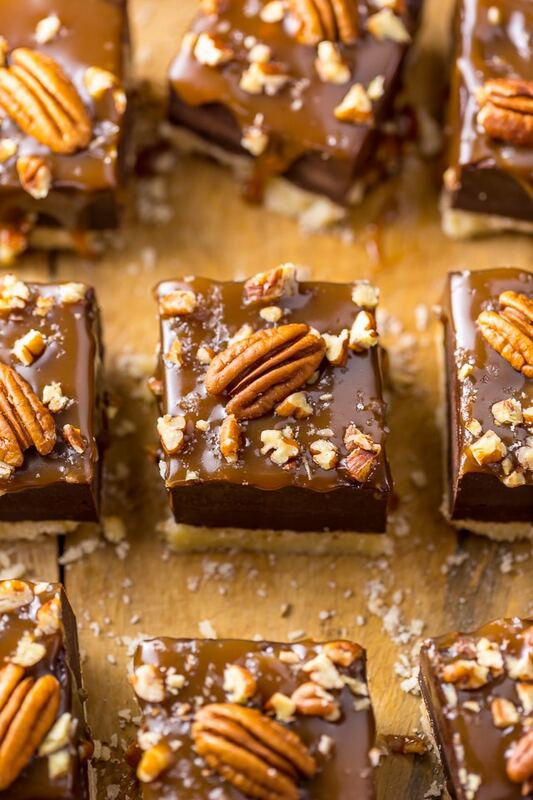 These Salted Caramel Turtle Fudge Bars are crunchy, creamy, and chewy! And the best part is they're so easy to make. Preheat oven to 350 degrees (F). Line an 8x8-inch baking pan with parchment paper, allowing two of the sides to overlap. Spray the parchment - and any exposed pan - with non-stick baking spray; set aside. In the bowl of a stand mixer fitted with the paddle attachment, or in a large bowl using a handheld electric mixer, beat the butter, vanilla extract, confectioners' sugar, and salt until light and fluffy; about 2 to 3 minutes. Gradually beat in the flour, mixing just until combined. The mixture will be a little crumbly. Dump the mixture into the prepared pan and spread (or press firmly, if need be) it into an even layer. Bake for 14 to 15 minutes, or until lightly browned. Set aside to cool while you prepare the fudge topping. In a microwave-safe bowl, combine the chopped chocolate, sweetened condensed milk and butter. Microwave, uncovered, on low, in 30 second increments, stirring in between each increment, until the chocolate is completely melted; stir mixture smooth. Stir in vanilla extract. Spread mixture over the shortbread, smoothing with a spatula into an even layer. Pour salted caramel on top of the chocolate mixture, then sprinkle with the toasted pecans. Refrigerate until firm; about 2 hours. Cut into small squares and serve. I’m just dying over here! Gosh, these look so rich and so good! I’m looking forward to trying them. Looks really nice, but I would like ingredients by grams. One cup of something is not the same internationally. Hey, i tried making the caramel sauce. I couldn’t find heavy cream so I used whipping cream instead. 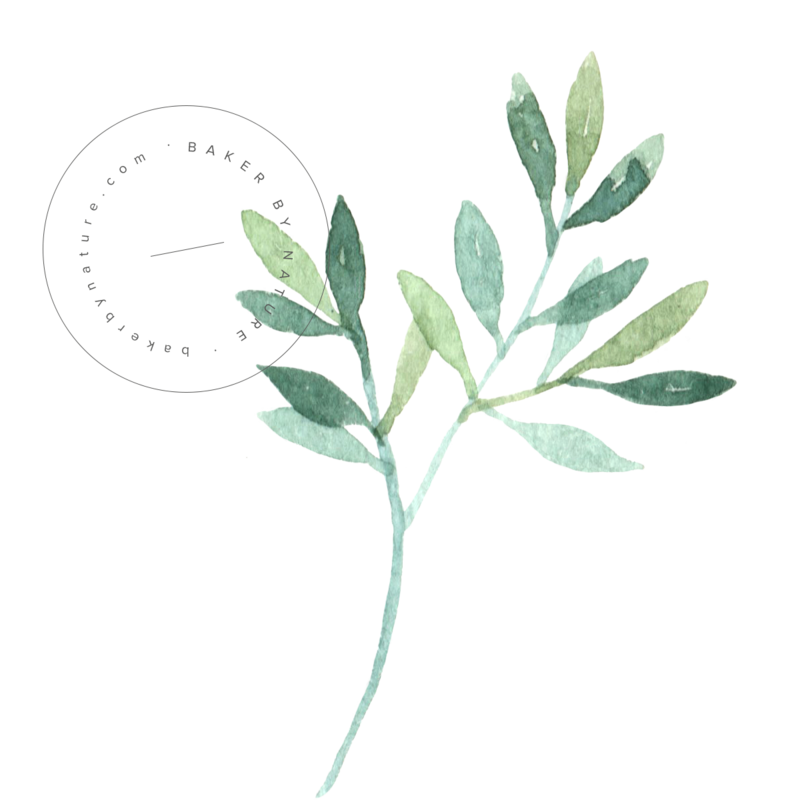 Not sure if this is my mistake or i did something else wrong but the mixture turned very liquid and white, it didn’t have the colour on your photos. Hi Silvia. It sounds like you may have under cooked it. The mixture takes a while to become that dark amber color. I’m going to make these for my mom.She is in a nursing home and she can’t get enough chocolate. She is 104 years old and she gets so excited when she receives candy. I made these recently and almost threw in the towel. The chocolate fudge part got ‘weird’ (used the recommended kind of chocolate} and followed the instructions. By weird, I mean it kind of got ‘globby’ and oily….hard to describe. When I put it on top of the shortbread, an oily film developed, which I blotted with paper towel. I finished making them, and served them at work…Well….the compliments I got! Several said it was the best dessert they had ever eaten! (And I supply my work peeps with homemade desserts all the time). So, I just retrieved the recipe out of my trash folder, and will definitely make these again…paying more attention as I make the fudge layer. I was hoping maybe you could give me some insight on what could have gone wrong. Could I melt the chocolate in a double boiler instead of using microwave? Thank you for your help and your recipes!